As noted earlier, these add-on vendors are available through the AppExchange partners at additional (sometimes significant) cost. A related problem is the possible lack of integration of a third party solution back to Salesforce.com for record keeping. For example, you may want your sales organization to be aware of which email campaigns your contacts have been exposed to. 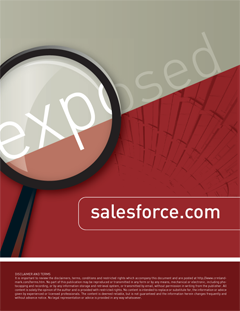 Another option is to use Salesforce.com’s mass email tool. This tool however is fairly basic and does not support the depth of functionality that is often required by many marketing professionals (link tracking, bounce management, read tracking, etc), plus the number of email communications that can be sent daily depends on which edition you are using. It is important to ensure these limits are adequate for the frequency and size of campaigns that you plan on executing. Salesforce.com’s marketing partnership with Google is evident with the Google AdWords support being offered in all editions including Group Edition. This partnership supports the ability to track the effectiveness of Pay Per Click (PPC) campaigns where organizations pay for placement within Google’s sponsored listings.